The third book. 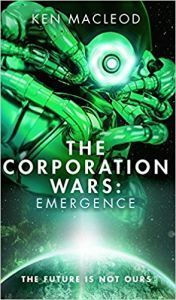 Emergence, in Ken MacLeod’s Corporation Wars trilogy continues straight on from the previous volume Insurgence where, as I explained in my review of that book, I had completely lost track of what was going on. A brief introduction to summarise the story so far or maybe a glossary that I could refer to to remind myself who was who might have been helpful before diving right back in to the plot.